Are you looking for white water rafting near Los Angeles? Are you planning a river rafting trip for your family, workplace, or church group? Come visit American Whitewater Expeditions and let us take you out on the American River. With trips suited for every skill level from beginner to expert, we have the right outing for you, no matter the group. We boast unforgettable rafting adventures and overnight wilderness weekends that are a half day’s drive north of Los Angeles. Head out to the American River! Choose the trip that’s right for you! American Whitewater has been navigating the rapids of the American River for more than 40 years. 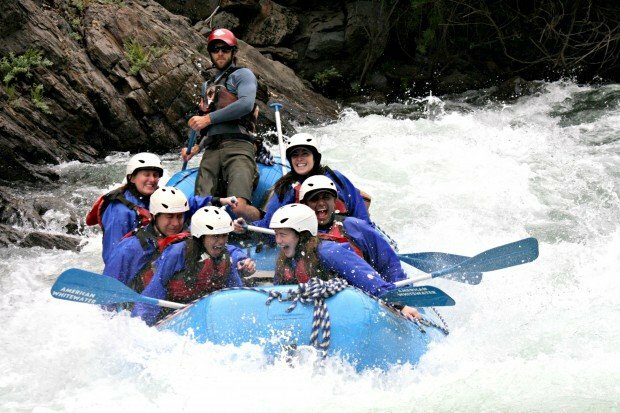 Our guides know the river like the back of their hand and they make sure that each rafting trip is an entertaining and enjoyable experience, allowing you to paddle and enjoy the ride in safety. We even have a photographer following along to document the trip so that you’re guaranteed to get some great shots of your entire group. Whether you’re out with a corporate group of rafting newbies or an experienced group of friends, we;ll tailor the trip to your needs. Bonding aboard a raft on the river will surely create memories that will last a lifetime. At American Whitewater Expeditions, you can take a break from the busy pace of life in LA stay with us for the weekend. Wake up right next to the American River in our scenic campground. It’s located in the stunning Coloma Valley and situated next to the Troublemaker Rapid on the South Fork of the River. Stay within a short walk from the James Marshall Gold Discovery Park where early prospectors discovered the nuggets that launched the Gold Rush. Enjoy free hot showers, indoor restroom facilities, an in-ground pool, a fishing pond, a volleyball court, or just relax by the fire and enjoy the outdoors. The six and a half hour drive from Los Angeles to the American Whitewater base in Coloma makes our rafting adventures the perfect weekend trip. Amazing rafting excursions are closer than you think. When you plan for two- or three-day getaway with us, rafting isn’t the only option. You can paraglide, hike, and swim, all in a gorgeous California setting. American Whitewater rafters frequently report that the adventures they have had on our whitewater tours are what make them keep coming back to visit us year after year. With a variety of activities, scenic outdoor settings and spectacular rafting, Los Angeles will seem like it’s another world. Take the opportunity to plan an overnight camping adventure and an experience that you’ll remember for many years to come. Book a trip now, or contact us to start planning your adventure!